Brían F. O’Byrne, 46, as Anthony in the Broadway production of Outside Mullingar, a play by John Patrick Shanley. Photo by Joan Marcus. Brían F. O’Byrne, 46, is currently starring in the Broadway production of Outside Mullingar, a play by John Patrick Shanley. O’Byrne, who grew up in Mullagh, Co. Cavan, trained at the Samuel Beckett Centre at Trinity College Dublin. He emigrated to New York in 1990, where he had a brother, and an uncle who lived in Queens. He lived with his uncle and got a job on a construction site before meeting up with Ciaran O’Reilly, also from Cavan, and the founder of New York’s Irish Repertory Theatre. The Rep was holding auditions for Philadelphia Here I Come. Brían auditioned and ended up being cast as “one of the lads.” He went on to have a long association with the Irish Rep, and when he wasn’t in a cast he was helping build sets. It was in one of the Rep’s productions that he first caught the eye of director Doug Hughes. ”He was so distinctive. Alive. Funny. You couldn’t help but notice him,” Hughes said in an interview with Irish America. 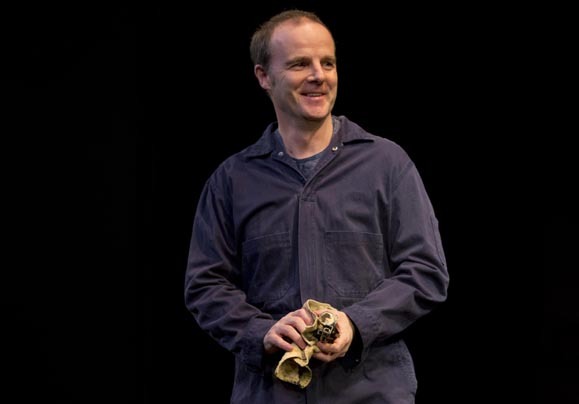 In 1996, O’Byrne attracted attention for his performances in the Martin McDonagh plays The Beauty Queen of Leenane as Pato Dooley (for which he received a Tony Award nomination) and The Lonesome West (1997). In 1998, Hughes directed Brían as a serial killer in Frozen, for which he won a Tony. In 2004, he played a priest accused of child molestation in Shanley’s Doubt, and was again directed by Hughes. In all, Brían has earned a Tony Award (plus five nominations); a Drama Desk Award (plus five nominations); an Obie, a Lucille Lortel, and an Outer Critics Circle award for his stage work. Television includes his Emmy-nominated role in Mildred Pierce, and roles in Prime Suspect, Flash Forward, Brotherhood, and the Irish series, now on Netflix, Love/Hate. Movie appearances include Queen and Country, Medeas, Million Dollar Baby, Before the Devil Knows You’re Dead, Brooklyn’s Finest, The International, and the upcoming Jimmy’s Hall. Brían is married to actress Heather Goldenhersh and they have two daughters. Well, I am away from my family today. As I have been for a lot of time this past year. I question is it worth it. I have been doing worthy “art” projects. In other words, projects for prestige rather than money. I question is it worth it? Is it worth missing my children’s days, and my wife’s hugs? And, of course, the answer is a resounding no. It’s not worth it. Life is too short. It’s time to change how I work. I have an old truck that was sold to me by a “friend.” It has cost me a fortune. I rarely drive it. But I’m too stubborn to sell it for a huge loss until I have had some fun out of it. Deep down I don’t think that will happen. Anyone want a 1959 Chevy truck? Not too much rust. I really try and see everyday heroes. Selfless people who work for the good of others. Or people who have overcome poverty or ill health, all the while seeing the joy in life. My phone, The New Yorker, a book and a candle. I picked potatoes on Saturdays when I was a kid. I don’t know what age I was, younger than 10, and when I was 12, I spent a summer on a bog bagging turf. Turf and potatoes . . . stereotype anyone? Holding someone’s hand, my head close to their knee, standing after taking a few steps up to the front door of a house. The door opens. Someone is happy to see me. Do you talk on plane rides? I would love to. But I hate when I get asked what I do. We then enter into an extended phase of someone excited that they might know me. Disappointed that I’m not famous. And then sad for me that I must feel like I’m a failure. So I usually have the headphones on. Quality you like in friends. Kissing my kids and my wife goodnight after goofing around in our home. Mullagh, Co. Cavan, and Doonin, Kilcar Co. Donegal. Too many places . . . If I’m in a place for longer than fifteen minutes the thought usually enters my head: “This could be a cool place to live.” It’s kind of unnerving. Favorite opening to a piece of music. The first notes of any music on the uileann pipes tend to excite me. The serial killer in Bryony Lavery’s Frozen. The first play you saw? One of the boys in Phildelphia Here I Come with the wonderful Irish Repertory Theatre Company (get membership now!). I got to meet another actor on that production who had just retired from teaching and was putting together some writings about his life. It was Frank McCourt, and he became a person who gave me a new way to look at the world. What would you do if you weren’t doing what you are doing? Sleeping. It’s late and I have a bunch of questions to answer. Babies. And turf. Even better if they are both in the same room. Any perfume on my wife.